Sorry to bring bad news but bubbleguuum has said this project is abandoned. Unfortunately but thanks for the info! I don't know if this topic has stil some interest (last post more than a year ago) but I make a try because I can't make the thing working even if normally should work. My aim is simply to play Foobar2000 from my main Windows XP desktop to a DLNA receiver in the kitchen through the wifi network. The receiver is a DLink Music Everywhere DCH M225, is in the same wifi network and is perfectly running AirPlay and DLNA from a mobile phone. I configured foo_upnp as described on Bubbleguuum main site and as in other internet pages. Many thanks for the support if still someone use this software. Did you try foo_upnp_out, see here? Works well for me. Hi, I tried it but it is different in design. It's only an output to another device, not a real server. Anyway it didn't work too, there was an errore message. Today I'll try again and I let you know. Maybe there are some ports to open in the router? Hi, I'm not sure if this goes here or in tech support (where I've also posted this). Can someone please tell me and I'll delete accordingly. I am wondering if there is code that can be used in the foo_upnp_ml_tree.xml file that will essentially not display any mp3 files if there is a flac file of the same song with the same tag and/or same file me (obviously except for the extension). I have two folders for my music. My (mostly portable) mp3/lossy folder that contains all of the music that I own and my archive quality flac folder (mostly from my Audio CD rips). Over the last 15 years however I have accumulated many mp3s that I don't have a flac for through various purchases, etc. I'd like to be able to add both folders to my music library however in specific cases, like when playing a genre (I have made a custom "Ben's Hits" genre with about 2100 songs) I'd like to be able to weed out the mp3s if there is a high quality version available. In this specific case it'll keep my "Bens Hits" genre at 2100 versus about 3200 if both copies are included. Alberto...did you ever get this working? A way to check if it is working is setup the server on one PC and then use foobar on another PC to see if you can find the server and play music on the 2nd PC from the 1st foobar music server. Or use the foobar app on an android phone...that will work too. That way you'll know that the foo_upnp server is working before you try to diagnose the DLink. I personally use the BubbleuPnp app on my phone to play music (and everything else) on my phone or even stream thru my phone from the server to my phone to another destination like my smart TV, my 7.1 receiver connected to my home theater, other computers, my bluray players, etc. I think there is a free version of BubbleUpnp that you can test out on at least a few songs. I try to use the component in order to stream onto Libratone Zipp device. It seems to work only for formats directly supported by the devince which unfortunately does not support ogg. 28.28321: PLT_CtrlPoint::ProcessGetDescriptionResponse(1394)/19384: INFO: Device "4cfdd855-67fd-480d-9147-632c3a9d7153" is now known as "Mediatomb"
28.28364: PLT_CtrlPoint::ProcessGetDescriptionResponse(1394)/9988: INFO: Device "95802409-bccb-40e7-8e6c-C80E144F5BF8" is now known as "Digitalsarg"
28.28366: PLT_CtrlPoint::ProcessGetDescriptionResponse(1394)/13320: INFO: Device "4d696e69-444c-164e-9d41-b827ebb0ac65" is now known as "ReadyMedia auf Raspberrypi"
28.28368: PLT_CtrlPoint::ProcessGetDescriptionResponse(1394)/16144: INFO: Device "75802409-bccb-40e7-8e6c-C80E144F5BF8" is now known as "Digitalsarg"
28.28370: PLT_CtrlPoint::ProcessGetDescriptionResponse(1394)/12576: INFO: Device "75802409-bccb-40e7-9f6c-C80E144F5BF8" is now known as "InternetGatewayDeviceV2 - Digitalsarg"
28.28378: PLT_CtrlPoint::ProcessGetDescriptionResponse(1394)/16524: INFO: Device "123402409-bccb-40e7-8e6c-C80E144F5BF8" is now known as "Digitalsarg"
28.28529: PLT_CtrlPoint::ProcessGetDescriptionResponse(1394)/9844: INFO: Device "3e5d42cf-9370-4fba-a07e-030a61a85517" is now known as "Heikes Lauti"
31.31675: PLT_CtrlPoint::ProcessGetDescriptionResponse(1394)/5980: INFO: Device "bdbb0834-469f-4e64-a8a6-63768bf6653a" is now known as "TOMMY"
32.32211: PLT_CtrlPoint::Subscribe(1562)/13532: INFO: Subscribing to service "urn:upnp-org:serviceId:RenderingControl" of device "Heikes Lauti"
51.51323: PLT_CtrlPoint::Subscribe(1588)/13532: INFO: Unsubscribing subscriber "uuid:795f126c-1dd2-11b2-8f76-d9f3c7015134" for service "urn:upnp-org:serviceId:RenderingControl" of device "Heikes Lauti"
It seems that "NPT_CHECK failed, result=-20401 " is where things start going wrong, but I hav no idea what it means and what I can do about it. Can someone drop me a hint? For comparison, I have inspected the log of a successful streaming to another device, and it still says "NPT_CHECK failed" and "NPT_ERROR_CANCELLED". Here is end of the file. It looks quite similar, only that in this case, playback actually works. 97.97481: PLT_CtrlPoint::Subscribe(1588)/9108: INFO: Unsubscribing subscriber "uuid:a68f68c6-c73c-852e-b68c-f443a13d0f6a" for service "urn:upnp-org:serviceId:RenderingControl" of device "Kodi (LibreELEC)"
Does anybody have an old version of this plugin? I stream to a Sony device that supports most of the playback formats, but even if configured to not convert or transcode, it still convert ape or dsd files to lpcm. I remember streaming native dsd iso with the old version of the plugin.. Does anyone know why my UPNP server is not seen from other foobar2000 installations on my local network computers? Computer discovering is enabled, UPNP service is enabled. What could be the problem? 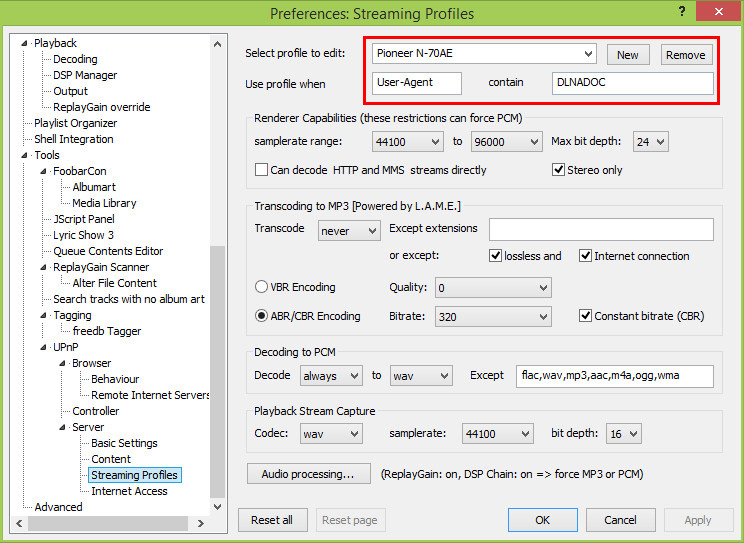 The streaming profile is set to: transcode 'never' only if lossless. So if I'm on my phone and want to download a M4A track foobar2000 on my PC would convert the track to WAV. If it is lossless, the track would be converted to MP3. Just like it set it up. But why is the M4A track converted to WAV at all? So I set it to: transcode 'always'. This means that FLAC or ALAC and also M4A tracks are getting converted. Okay. But I think M4A doesn't need to be transcoded, a transcode of lossless files would be enough. Next and bigger problem: if I download some transcoded MP3 files, all the metadata is missing. The metadata is all there in playback, but after downloading it all is gone. Does anyone know how to solve this problems? The Files are not detect correct. The UPNP System Play 284400 bit 24bit ? I have BubbleUNPN setup on my phone and I'm able to stream over the internet to my phone without issue. Is there a way I can install Foobar on my work laptop and stream that way as well? I've never used F2K as a client for streaming so I don't know how this works at all. I just installed foo_upnp to stream audio from foobar2000 on my Windows 10 laptop to my Roku Ultra. Basic functionality worked right out of the box, but I still have issues. (2) If I can get the above problem solved, is there a way to select multiple folders (or subdirectories) for continuous playback? Probably obvious, but it's eluding me. (3) It -- and I say "it" because I'm not sure if the fault is with foo_upnp or Roku -- doesn't seem to recognize all playlists. For example, I have two m3u playlists in one directory, but only one of them shows up on screen. Or is there a better solution than foo_upnp? I know Plex is popular, but I have some concerns about their privacy policies. I don't download pirated material; I just find it creepy that outsiders might learn of my fondness for 1920s jazz or French accordion or whatnot. PS - Apologies if these questions have been asked an answered here. I tried to search but didn't find what I was looking for. Please be gentle! Thanks. The answer to most of these are: does that app you are using support this. The media server just serves the files. You'll need an app to "add to playlist" or something like that to add lots of folders\songs. The foobar media server literally only "shows" what's available. The app is responsible for doing all the playing/sorting/adding/etc. I had a roku for a while but I couldn't find a good app to use as a media\music renderer - they all seemed very limited to me. Got an Amazon firestick and there are literally hundreds if not thousands of great apps. However I believe a good workaround for this is don't use the Roku/Firestick as the controller...just use it as the renderer. Use your phone or tablet as the controller...I use BubbleUpnp and it works like a charm. You tell it to send the signal to whatever (Roku) and you control the volume/fast forward/etc. from the phone. Hey. It seems since upgrading to Windows 10 I am unable to save changes I make. I've tried changing file permissions on the foo_upnp.xml to no success. Has anyone else had this issue & able to help? I noticed a problem with playing files through UPnP to my network player Pioneer N-70AE. I have created a profile for my player (Pioneer N-70AE) but unfortunately it is not loaded when streaming my music. On the previous version of foobar it worked very well but today I checked it (foobar2000 v1.4) and unfortunately it does not work. Columns UI/Tab stack: Warning: Playlist Organizer panel was visible on creation! This usually indicates a bug in this panel. foo_upnp: 0.224: PLT_Service::ProcessCancelSubscription(699)/6708: WARNING: Cancelling subscription for unknown subscriber uuid:5371c547-8508-8c7f-c8b9-a75d37995ade! When I streaming music through BubbleUPnP, everything works fine and the BubbleUPnP profile is loaded (I see it in the console). Can something disturbing be read from the log I posted ? Anyone used this with a Cambridge Audio CXN. Also, can you use this with other DSPs enabled e.g. MathAudio for room correction? I got "Playback Stopped" error, always after a few seconds of playing a song, with the Plugin installed. This did not occurr, when I stopped the Renderer Server in the UPnP settings. Just found about this component, it's simply brilliant, thanks a lot to the devs. The only issue I had was that the stable app didn't show all playlists and music folders on Media Library/Folders, but I managed to fix it by joining foobar2000 Beta program on Play Store and installing a beta build (1.1.30). Now everything is working like a charm, thanks. I changed my setting on the squeeze2upnp to force it output to "always 16bit". Then, problem solved. I would like to know if I can somehow enable 24bit playback throughout the playback chain. BTW, at 16bit the whole thing is running pretty reliably. I am inserting the foobar2000 in the chain so that I can run a VST plugin, namely forthcoming Dirac 2.0 VST plugin. I would be interested to know if there is an easier way to put a VST host in the playback chain.